Since returning from Spiel I’ve been playing more of the new games that were launched there and I thought I should add to my initial report with my notes on these. Here they are, in alphabetical order of title. Stronghold Games have made quite an impact in the two years they’ve been going. They caught my attention by producing a new edition of Survive/Escape from Atlantis in their first crop of titles. While they’ve continued to renew old favourites, Stronghold quickly started publishing new games as well. They had examples of both to show us at Spiel ’12. The new editions of Crude (aka McMulti) and Outpost looked terrific. Both classics, of course. For those of you not as long in the tooth as me, Crude (originally published in 1974) is a terrific oil industry game – drill, refine and sell petroleum – with some great components. Outpost (rather younger as it dates from 1991) is a game of production and development in a science fiction setting. The game’s system has since been used in Scepter of Zavandor and (in a condensed version) Phoenicia. Stronghold’s brand new games included the well-received CO2 and Article 27. The latter is the one I’ve played, having first encountered it in pre-production form at the Gathering last year. Designed by Dan Baden, it is set at the United Nations with the players representing a country on the Security Council. In turn, each chairs a session, trying to get a resolution passed by the council. Players gain or lose points according to how closely their own policies (coloured chips held by the players) match the resolution on the table. However, they can also be bribed incentivised to vote for the resolution. 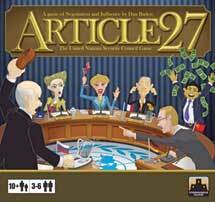 Article 27 is a fast moving game of wheeling and dealing reminiscent of I’m the Boss – it’s helped by a timer that gives a maximum of five minutes negotiation time. It’s been good fun both times I’ve played with some outrageous bargaining and surprising about-turns by players when offered enough money! 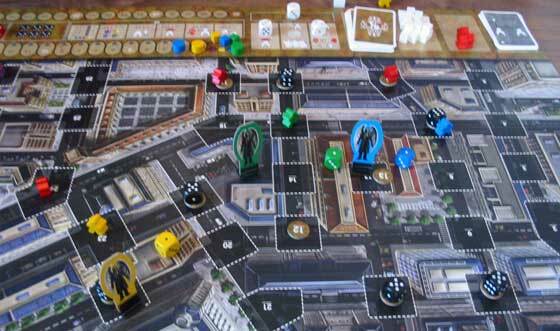 Each player also has a secret agenda that generates extra points at the end of the game. Article 27 is for 3-6 players (the more the merrier, I reckon), aged 10+ and takes 30 minutes to play (controlled by the timer). I give it 7/10 on my highly subjective scale. In my first report from Spiel, I mentioned that my favourite of the games I played there was Yedo. Since then I’ve played Keyflower. Wow! There’s a good pedigree here as the co-designers are Richard Breese (originator of the Key… series of games) and Sebastian Bleasdale (designer of On the Underground and regular at Swiggers games club). The Keyflower is one of the ships bringing workers to the players’ villages at the end of each season (round) – others include the Sea Breese and the Sea Bastion (groan!). The game is played over four seasons with the last, winter, being all about scoring points. While players can generate some points in the other three, the emphasis here is producing stuff. The two main components of the game are the stack of hexagonal tiles, representing buildings and ships, and the bag full of wooden ‘meeples’ – workers. Players use their workers to bid for tiles or to operate buildings – whether these are in their own village, someone else’s village or being bid on. Workers in winning bids go back in the bag, while players get back those on buildings in their own village (regardless or who put them there). There’s an awful lot going in this game – most of it embodied in the buildings and what they do. Clearly, you’re looking for the right buildings to produce the right resources, skills and workers to generate enough points to win. How you do this depends on which buildings are available and which ones you manage to get. Phew! I’ve played Keyflower several times now (mainly as a three-player game) and, while I’m comfortable with how to play the game and am having a lot of fun, I’m nowhere near winning. 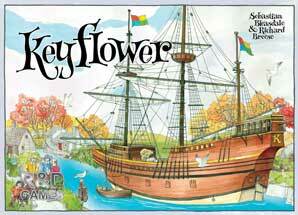 Keyflower is for 2-6 players, aged 13+ and takes about 90 minutes to play. It gets a provisional 9/10 on my highly subjective scale. Portuguese publisher Mesa Board games has produced some interesting games and had two new titles at Spiel. 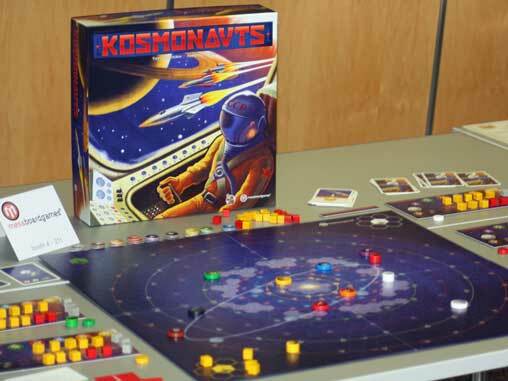 The first of these (alphabetically) is Kosmonauts, The bold colours of the board, showing the solar system with the orbits of the planets (plus Halley ’s Comet), immediately caught my attention. However, this is not an intricate, realistic simulation of space travel like High Frontier, but a fast-playing race game. Each player starts with their rocketship at Earth and aims to race round the solar system, visiting (nearly) all the orbiting objects (that is, the planets plus comet). Two things make this tricky. First, the planets (and comet) move in their orbit each round. So you’re aiming at where the planet/comet will be when you arrive in its orbit (one tactic is to arrive ahead of it and wait for it to catch up). If a ship stays ‘on’ the planet, of course, it will be carried along – another useful tactic, especially when using Halley’s elliptical orbit to scoot from inner to outer parts of the system (or vice versa). The second tricky bit is that movement is Newtonian. The ships continue moving in the direction they’re going, unless players modify this by using up some of their fuel. It’s a little tricky to get your head round at first. On top of this, players also need to re-fuel, which uses up a turn on a planet. Players get points for visiting the planets and comet, according to the order they arrive. The game ends once one player has returned to Earth, giving the others a couple of rounds to complete their trips. Most points wins, of course. Kosmonauts is not a particularly deep game, but it’s good fun (provided it keeps moving at a reasonable pace) and you do have to think a bit. The game is for 2-4 players, aged 8+ and takes 60 minutes to play. It gets 7/10 on my highly subjective scale. Having just mentioned High Frontier, the next on my list is from the designer of that game, Phil Eklund, and his imprint, Sierra Madre Games. 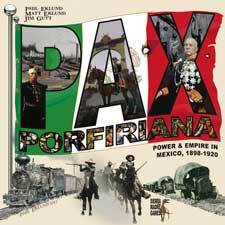 Pax Porfiriana is a card game of the Mexican revolution that contains an awful lot of history. Not least because Sierra Madre’s first game was Lords of the Sierra Madre, a board game of the Mexican revolution. That’s more than twenty years’ worth of further research and refinement to go into the new game. The players are ‘Hacendados’ (tycoons) in northern Mexico, looking to build up their own economic, military and political empire across the region. This is done by acquiring cards – there’s a neat mechanism for the market – and playing cards. Some cards represent enterprises, significant people or military forces and stay in front of players, generating income for them. Other cards are events or incidents that are used when played (though some may linger for a while). The aim is to overthrow – or succeed – the Mexican dictator, Porfirio Diaz. As the game starts, there is peace – the Pax of the title. This continues until someone plays a card that introduces martial law, say, or provokes the Americans into intervening. These change the ‘state’ of the game and introduce a different economic and political climate. The state of the game defines the way in which Diaz can be overthrown. This is triggered by a ‘Topple’ card and, when it’s played, the player with the most points in the appropriate criterion wins – if they have enough points!On first acquaintance, I found Pax Porfiriana rather baffling. However, once I understood the mechanism for winning (build up your points in one of the criteria, switch the current regime to the one you need and use a Topple), I realised how it works. It is definitely a game in which you need to establish your position and build on it – there are no quick wins here. It is also packed full of historical incident and fact and worth playing just for the experience. Pax Porfiriana is another terrific game from Phil Eklund and gets an initial 8/10 on my highly subjective scale. It is for 2-5 players, aged 12+, and takes 2-3 hours to play. The second game from Mesa is a different kettle of fish. Ragami is about guardian angels. The board shows a city from above: blocks of buildings separated by streets. Down on the streets, souls are in conflict: open to temptation and beset by demons. Players each have an angel, on the rooftops, and a saint, on the street. They use these – perhaps with the support of other players – to resolve the conflicts and chase off the demons. But new conflicts are always appearing…Dice are used quite a bit in Ragami, for indicating strength as much as for rolling. Each conflict is represented by a die with the uppermost face showing its strength. Each turn that a conflict isn’t dealt with, its strength goes up until it is removed from the board (score one for the bad guys!). Similarly, each player has a die that shows their reserve ‘virtue’ and this also increases each turn. They can also gain ‘power points’ (white cubes) by assisting other players, which is a neat touch. These can then be used to bolster their own strength when resolving a conflict. The number of actions available between all the players each turn depends on the roll of dice. One die goes against each action on the board to show how many times it can be used that turn. The positions are chosen by the player to the right of the start player, who can also alter the values of the dice (within limits). This is a very clever mechanism that provides players with some interesting decisions each turn. Ragami is a highly tactical game for 2-4 players, aged 10+, and takes 80 minutes to play. I enjoyed it, but found it a bit too abstract for my taste: it gets 7/10 on my highly subjective scale. The Stratamax team seems to have got a taste for quality production since the second edition of Tammany Hall. I was introduced to their latest game, Sheepdogs of Pendleton Hill, with two words: “Big wood!” And indeed, inside there are both lots of wood and some large pieces. The big figures are players’ shepherds, which will be placed on the hill depicted on the board. This is divided into sections each with a points value – which is higher the further up the hill it is. The smaller wooden figures are the sheep – in the players’ colours again. These go into pens at the bottom of the hill and will eventually set off up the hill in a group. Players score points when sheep meets shepherd. The points depend on how far up the hill the sheep gets, of course. 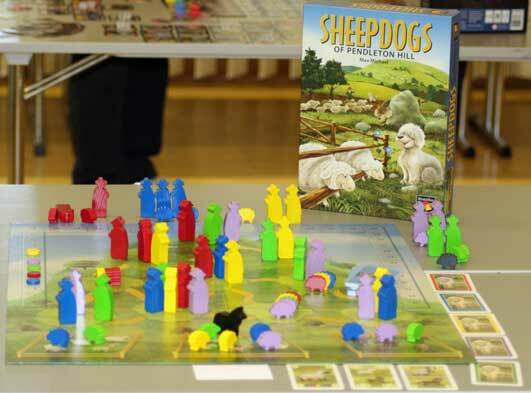 The clever bit is that, within restrictions, players can place other people’s shepherds and move other people’s sheep. So your sheep may not get that far up the hill! There’s one final piece: the wolf! This provides another way of getting at other players by having their sheep taken out by the wolf. However, the game is not a free-for-all. Play is regulated by cards: each player has a hand and what they can do in a turn is limited to the actions available from cards in their hand. If you don’t have a wolf card, you can’t move the wolf. Sheepdogs of Pendleton Hill is not the deepest game, but it’s entertaining and has some surprising tactical subtleties. It’s for 3-5 players, aged 10+, and takes about 40 minutes to play. I give it 7/10 on my highly subjective scale for the time being. And then I played (finally!) Snowdonia. Double wow! Tony Boydell has created something special for Surprised Stare Games – and quite different from the card games he’s designed in the past. I am only sorry it’s taken me so long to get to it! 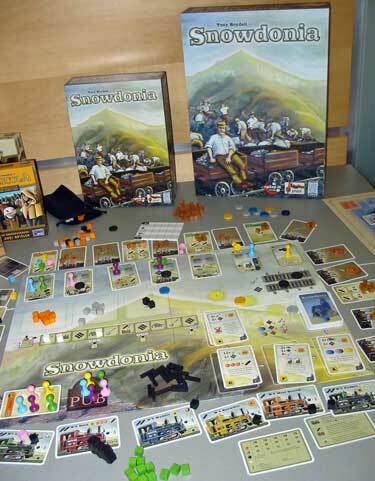 The game is about the construction of the Tramroad railway up Mount Snowdon. While the board is illustrated with the mountain, the track is represented by the line of cards that is laid out around three sides of the board. The cards show stations and the intervening stretches of mountainside on which track will be laid. However, the railway bed must be excavated first. In game terms, this means removing the ‘rubble’ cubes laid on each card. Excavating is one of the actions players can assign their workers to each round. So, too, are laying track and building stations. Both of these require raw materials – stone, coal and/or steel (produced from iron ore in another action). The board shows the actions players can take, the raw materials available and other useful stuff – such as the weather. The amount of work that goes on depends on the weather: the work rate goes up if it’s sunny, down if it’s raining and stops altogether if the fog descends. The game cleverly pushes things on regardless of the weather, which stops it from bogging down. Add into this cards that players can acquire and use for special actions during the game and/or bonus points at the end and locomotives that allow players to hire an extra worker and there’s an awful lot going on. However, it’s all so well integrated that you don’t notice the complexity. Snowdonia is terrific stuff and I give it an initial 9/10 on my highly subjective scale. It’s for 1-5 players (there’s a solitaire option), aged 8+, and takes about 45 minutes to play. I couldn’t resist Tweeeet, the latest game from Corné van Moorsel and Cwali. Apart from the appealing title, the game has some wonderful playing pieces: brightly coloured little birds (with either a red breast or a blue throat) and an assortment of bird food – nuts, fruit, caterpillars and ladybirds! It looks absolutely gorgeous. There isn’t a board as such. Instead, the playing area is constructed ahead of the advancing birds from cardboard strips divided into hexagonal spaces. Spaces may show food, in case the appropriate piece is placed on it, or hazards for the birds to avoid. In turn, players move their bird across the terrain and land on some food. They must use enough food for the distance they’ve moved and then pick up the food they land on. The last strip of terrain is placed face down to show a row of nests. The game ends when all the birds are on their nest – or have run out of food. Players’ scores are the value of the food they have remaining. However, the game is played in teams – robins versus bluethroats – and it’s the average score across the team that matters. This allows odd numbers of players to take part without any special rules. This sounds simple, but you quickly discover the tactical subtleties when you play. Dawdle and you can find no food left. Rush ahead and you won’t have as many points as those behind. Eat the wrong bits of food and your teammate has nowhere to go! 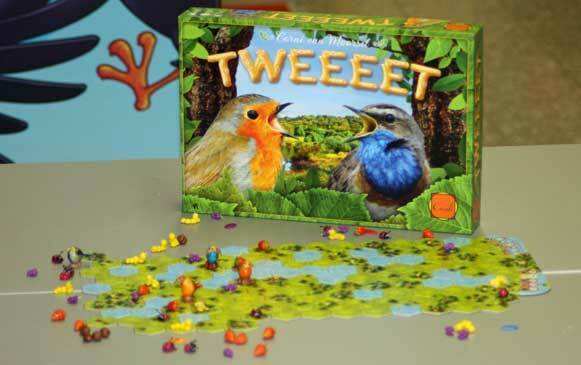 Tweeeet is a great family game and a nice filler for gamers. It’s for 2-6 players, aged 7+, playing in 30 minutes and I give it 7/10 on my highly subjective scale. When Sebastian Bleasdale suggested we play We Will Wok You and giggled, I assumed he was having me on. Nope: it’s a card game he designed, published by Pegasus Spiele. Though the theme is all Pegasus’s work, he insists. The cards come in three types. The Wok cards show the ingredients required for a dish, while the Ingredient and Coin cards are self-explanatory. In turn, players can take a coin from alongside a row of ingredients, making them cheaper for the next player. Or they can buy a row of ingredients by putting down as many coins as are already there. A new row goes down, but it’s going to be pretty expensive to start with. Or they take a wok card by placing a set of ingredients on the table. When the cards run out, players score points for the dishes they are able to make from the cards they have on the table and in their hand. It’s a neat game, enlivened by the illustrations on the card, and makes a decent filler. I wasn’t particularly taken with it, though, and give it 6/10 on my highly subjective scale. We Will Wok You is for 2-4 players, aged 10+, and takes 40 minutes to play. 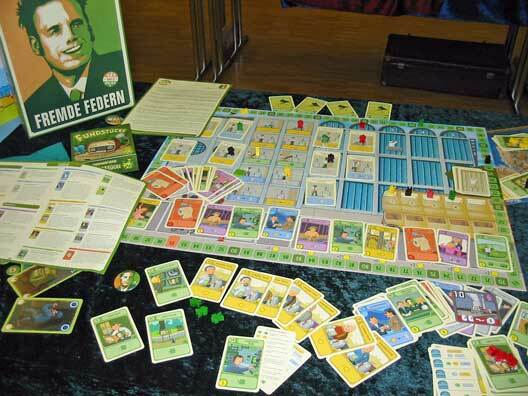 The latest from Friedemann Friese’s 2F Spiele is called Fremde Federn – which I’m told translates as “To Adorn with Feathers”. The English language version (from Rio Grande) is more prosaically titled Copycat. The cover picture shows Friedemann in the style of the famous election poster of Barack Obama, so clearly the game is about elections. Though it feels more like an office game as players spend much of their time deploying campaign workers into Federal offices. As well as taking actions with their workers, Agricola-style, players have a deck of cards that they use, Dominion-style, to score points and/or buy cards. New cards are purchased from a track and unsold cards move along this, Through the Ages-style, to get cheaper each round. This is why the game is called Copycat: its key mechanisms have explicitly been taken (with permission) from other games – and there’s a dash of Puerto Rico as well. Having played it once now, the resulting game seems to work satisfactorily. However, it didn’t really feel like any sort of election. I definitely need to play it again, but at the moment I give it an initial 7/10 on my highly subjective scale. Copycat is for 2-4 players, aged 12+, and takes about 95 minutes to play. Spiel is organised by Friedhelm Merz Verlag, who did a fine job as usual on this, the 30th event. Spiel ’13 is scheduled for 24th-27th October next year and I fully intend to be there. For more details, see the Friedhelm Merz Verlag website. Photographs by Pevans (P) and Mike Dommett (M) and Pevans played with Photoshop. Game artwork courtesy of the publishers. This part of the report was first published in To Win Just Once 131 (January-February 2013). Page created 20th January 2013. Last modified 26th January 2013. © Copyright Paul Evans, 2013.